I set up Bright in Mind and Spirit in Hugo’s name. It’s Hugo’s legacy. (Bright in mind and spirit is what his name means). Hugo was so full of spirit and determination, and I am aiming to emulate that through this organisation. I work in the NHS in communications. It’s a profession I am passionate about doing well, for the benefit of patients. I have a particular interest in communication between clinicians and patients, and in patient information. In amongst the myriad of other emotions, I found my experiences as a patient and as a parent fascinating. Most of my experiences have been excellent, but there are several incidences where issues could have been avoided and stresses reduced if there had been better communication between health professionals, and between health professionals and me. Good communication costs nothing, but can create a world of difference to a patient’s experience. I would like to use my experiences to raise awareness of the importance of good communication between health professionals and between health professionals and patients. I would like to advocate for change, to improve services and to help others. Improve information and signposting for parents whose baby or child has died. The changes that are needed are often simple, but they can help make the worst times of our lives feel just a little bit easier by knowing what to expect, what to do, and who to turn to for help. The information needs to be produced in a way that is in plain language and easy to digest. The logo has a very special significance. I am very proud of Hugo: he is my little star. Twinkle, Twinkle Little Star was one of the nursery rhymes I used to sing to Hugo when he was still in my bump, and he loved to boogie away to it when he was in his incubator. Each of the five stars represent a precious week of my son’s life. Channelling my grief, anger and frustration into this project helps me find a way forward in my heartbreak. Helping other people in Hugo’s name helps me by thinking his life was not in vain, and that he will always be remembered. I’m pleased to have worked with the neonatal unit at St George’s Hospital, London (where Hugo was cared for) about simplifying, improving and updating the information that is given to bereaved parents after their baby has died. In addition to Hugo’s Legacy, I’m proud to be one of the leaders of the Maternity Experience (#MatExp) campaign, identifying and sharing best practice among the nation’s maternity services. 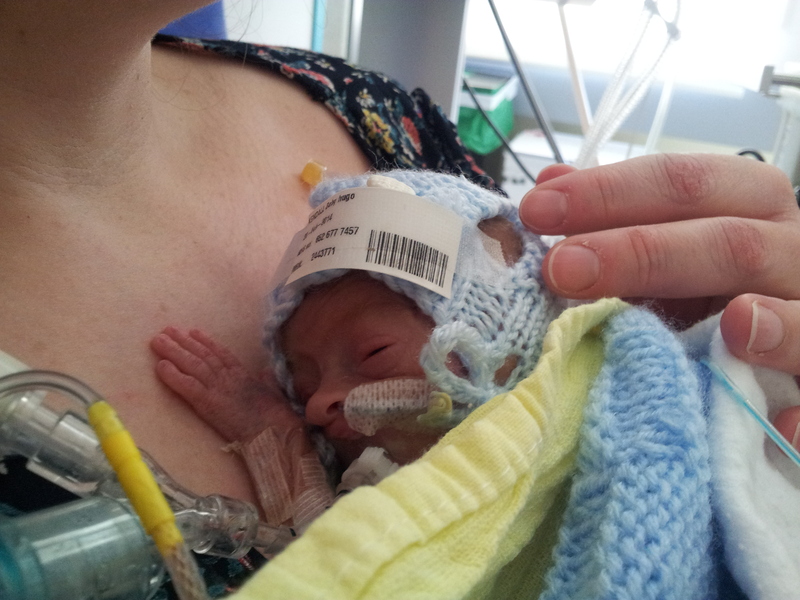 My activities with Hugo’s Legacy and the Maternity Experience campaigns are mostly self-funded. Fortunately, some organisations refund my travel expenses but otherwise travel, attendance at conferences, hosting this website, and other related activities come out of my pocket. (or directly through PayPal to leighk77@hotmail.com). I am so sorry for the loss of your beautiful Hugo. I don’t pretend to be able to imagine what you are going through. I followed a link on my Twitter feed about BritMums keynote, & have found myself reading through most of your site. Obviously, it is very sad reading, but your posts are also beautiful & informative & compelling. Hugo’s Legacy is a wonderful initiative. Both it and your blog stand as powerful testaments to Hugo’s memory & to you as a mother. What beautiful photographs of a gorgeous and brave little boy and his mummy. I am so sorry for your family’s enormous loss, Leigh – I can see how much you love him and how proud of him you are. My older sister died while my mom was giving birth to her, in 1967. There is a Julie-shaped hole in our family even though I never knew her. There are enough memories from my dad and enough desires and tears from my mom to make Julie very real to me and my younger sister, and I don’t think there was ever any question of erasing her existence from our family – we were just a family who had suffered the loss of a loved one. This website and Hugo’s Legacy is an amazing way to honour his life. I wish you strength and whatever love a stranger can offer to you to carry on with your project for him. …Overlook their stupidy.You feel as though your baby has been stolen.We buried ours by my mother.Dont let them keep it at the Hospital because they just do wht they want to with it and throw it in the incinerator..God Bless each one of you who have gone through losing a baby and God bless these people who come and do pictures. I also lost my son, Jack, to preeclampsia and HELLP. We somehow were one of those odd cases that doctors never see of pree and HELLP developing before 20 weeks and had to induce his delivery at 20 weeks1day for my own health and safety. I’ll be keeping you in my thoughts and prayers during this difficult time.